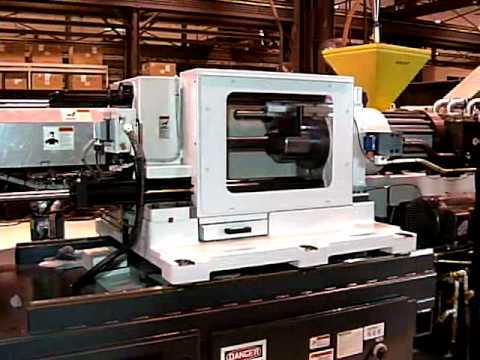 PowerPAK all-electric injection molding machines provide an increase in tonnage over similar models. With energy savings of 50-60% over similar machines, Milacron’s PowerPAK offers environmentally sound equipment that provides speed and repeatability, cleanliness, and highest part productivity, quality and profitability. Configured precisely to production requirements and applications, PowerPAK allows customers to combine a large range of clamp and injection units. With a high speed, ultra-precision rack-and-pinion clamp, low inertia motors that increase response, and higher performing components than other packing machines on the market, PowerPAK gives you a competitive advantage in the market while reducing your operational costs. MOLDGUARD advanced protection software is exclusive at Milacron and comes as part of the MOSAIC Control package standard with all PowerPAK machines. MOLDGUARD software measures the force required to close the clamp and compares this force to a reference curve from the previous cycle. During the first clamp-close cycle, force is stored as a reference curve. A new baseline is recorded whenever the clamp set points change. When a new reference curve is being collected, MOLDGUARD is not active. However, Mold Protect is always active, so even during a new reference cycle, there is mold protection. An Alarm Band set by the user is added to the reference curve force values. When the next clamp-close cycle is running, the current clamp position force is compared to the stored values from the reference cycle. Since it is more difficult to push through plastic than through air, the force value will be greater when a part is stuck. When the force required to close the clamp is greater than the reference curve plus Alarm Band, an alarm sounds and the clamp retracts. The Max Force Deviation display box on the control screen is used to help the operator determine what value to put into the alarm band in order to run with a tight band, but avoid false alarms. The value displayed in this box is the maximum force difference from the reference curve to the current cycle’s curve. The PowerPAK single roller screw provides a much simpler means of conversion of rotary motion from servo motor to linear motion of injection plunger. This results in long term reliability and durability for the user. Other designs with multiple ball screws require multiples of belts, pulleys, and sensitive adjustments to ensure balanced loading between multiple load-bearing actuators. PowerPAK’s 2-stage injection unit has a unique flighted plunger tip. Coupled with the side entry porting of material from the extruder, “first-in first-out” material management is assured. Every particle of material sees exactly the same heat history regardless of whether it is in the front or the back of the shot and regardless of the shot size. PowerPAK’s 2-stage injection units change colors and process engineering materials with no more difficulty than in reciprocating screw machines.